As part of our constant engagement with social actors to provide information and opportunities to participate in the Summits Process, the Summits of the Americas Secretariat (SAS) participated in several activities in the framework of the 40th General Assembly, including a Dialogue with youth in the “Talent and Innovation Competition of the Americas” (TIC Americas), the Forum on Participation and Advocacy of Afro-descendants before the Organization of American States, and dialogues between Member States, the OAS Secretary General and civil society. On June 4th, the Dialogue “Youth Participation in the OAS” took place in the framework of the TIC Americas held in Lima, Peru. This dialogue session was organized by the Young Americas Business Trust (YABT) and the OAS to inform the young representatives about the tools for their participation in the OAS activities and the Summits Process, especially in view of the developments made after the 2008 General Assembly held in Medellin, Colombia on “youth and democratic values” and the designation of an OAS Youth Focal Point. Participating in this dialogue were the finalists of the TIC Competition, students from local universities and representatives of institutions from Peru, along with the OAS Assistant Secretary General, Ambassador Albert Ramdin, representatives of the YABT, the Summit of the Americas Secretariat, and the Youth Focal Point. In his speech, Ambassador Ramdin mentioned the strategy of the OAS to engage young people in the region and the importance of their contributions to the OAS and to national governments, highlighting that "young people have a role to play in society, but can not define that role if they are not directly involved". 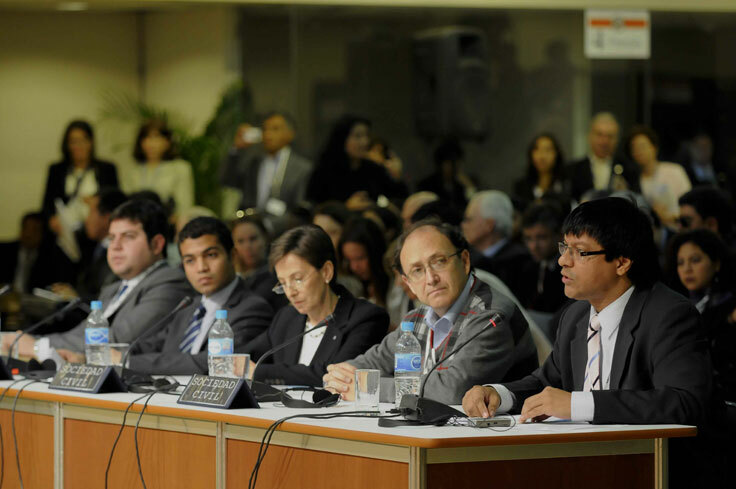 YABT presented the results of the Youth Forum of the Americas, which was held in the context of the Fifth Summit of the Americas in 2009. The OAS Youth Focal Point presented the working approach of the OAS with regard to youth, and the Summits Secretariat referenced the spaces available for youth participation in the SAS and the tools that diverse social actors have to be fully involved in the Summits Process. In this regard, the Summits Virtual Community (SVC) was presented, and participants were invited to get involved in this online tool, in particular to join the “youth group” created in the SVC. Please find a related press release here. The SAS also participated in the Forum “Participation and Advocacy of Afro-descendants before the Organization of American States”, which was organized by Global Rights and CEDEMUNEP in Peru with the objectives of increasing awareness about the OAS among afro-descendant organizations and representatives, providing information about the mechanisms to participate in the OAS activities, and presenting information for participation in the Inter-American Human Rights System, the Special Rapporteurship for afro-descendant peoples and racial discrimination, as well as in the Summit of the Americas process. As an outcome of this Forum, participants elaborated the declaration of Afro-descendants to be presented in the dialogue with Ministers of Foreign Affairs and the Assistant Secretary General in the framework of the 40th OAS General Assembly. You will find the final declaration presented in the Forum here. On June 5 and 6, civil society organizations and other representatives dialogued with the Secretary General, the Assistant Secretary General and the Heads of Delegation of the OAS Member States. In the diaogue between the Secretary General and the representatives of civil society organizations, participants shared comments regarding the theme of the General Assembly “Peace, Security and Cooperation in the Americas,” on the four OAS priority areas (democracy, human rights, multidimensional security and integral development), and on the ways to ensure a fruitful collaboration between civil society and the OAS. The video (in its original language) can be found here. On June 6th, three dialogue sessions took place in the National Museum in Lima. The first session was the dialogue of heads of delegation with labor representatives, who presented their perspectives and declarations. Please find the video of this session here. The sessions continued with the dialogue between the representatives of the private sector, the video of which can be found here (original language only). In the final session, representatives from civil society organizations and other social actors participated, representing the Model OAS General Assembly (MOAS), youth, persons with disabilities, women, sexual orientation and gender, and afro-descendants, as well as representatives of organizations working in the themes of democracy, corruption and civil society participation, peace, and human rights. The complete session can be found by clicking here. Finally, the approved Resolution AG/RES. 2612 (XL-O/10) “Increasing and Strengthening the Participation of Civil Society and Social Actors in the Activities of the Organization of American States and in the Summits of the Americas Process” included for the first time the terminology “social actors”, which refers not only to civil society organizations, but also other actors such as indigenous peoples, youth, afro-descendants, academics and think tanks, women and gender groups, private sector and labor actors, among others. Please click here to read this resolution." Unless otherwise indicated, the materials published on this website, including opinions expressed therein, are the responsibility of the individual authors/compilers and not those of the Organization of American States (OAS), or its Member States. © 2009 Summits of the Americas, Organization of American States. All rights reserved.